Michael A. Steinback joined Stonebridge as a Partner in 2002. 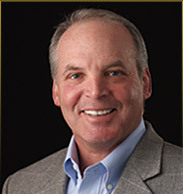 He was previously the President and Chief Executive Officer of CII Technologies, Inc., formerly a Stonebridge portfolio company and a $210 million leading diversified manufacturer of advanced control electronic components providing unique solutions for the Mil-Aero, HVAC, commercial/industrial, communications and ATE markets. Prior to that, he served for four years as the Executive Vice President of Sales and Marketing Operations for C.P. Clare, Inc., a leading global supplier of solid state components and, prior to that, for fourteen years as the Chief Operating Officer for Magnecraft Electric Company, a leading supplier of general purpose components and timers. Mike has over 26 years of experience within the electronic components industry, serving for two years on the board of directors for the NARM Division of EIA, as well as a variety of leading component, manufacturing, and distributing businesses. He is a graduate of Indiana University and the DeVry Institute of Technology. Mike previously served as an Operating Partner for BondCote, Alpha Packaging, Durcon and Delta Plastics. Currently he is an Operating Partner for ADI and an Operating Advisor for BrandFX and Hydraulex.